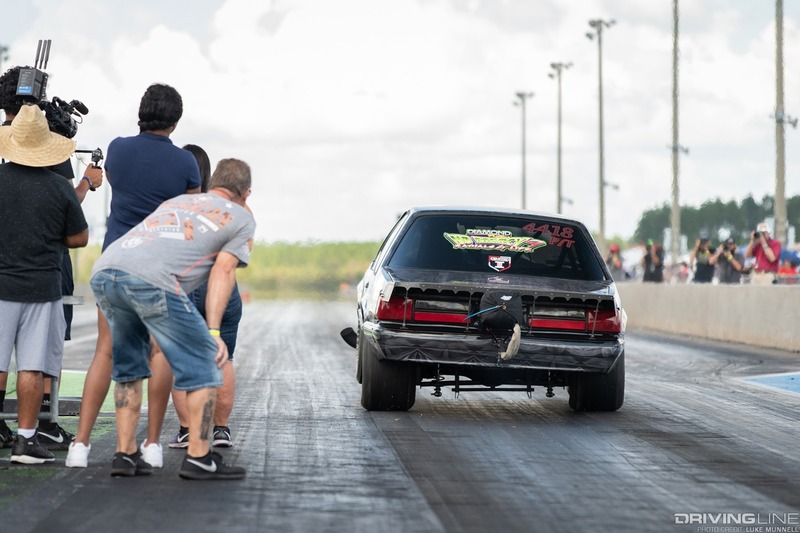 You might’ve seen a video making the rounds on social media lately in which a slammed, Fox body Mustang lifts its front wheels on the dyno and churns out 3,920rwhp. 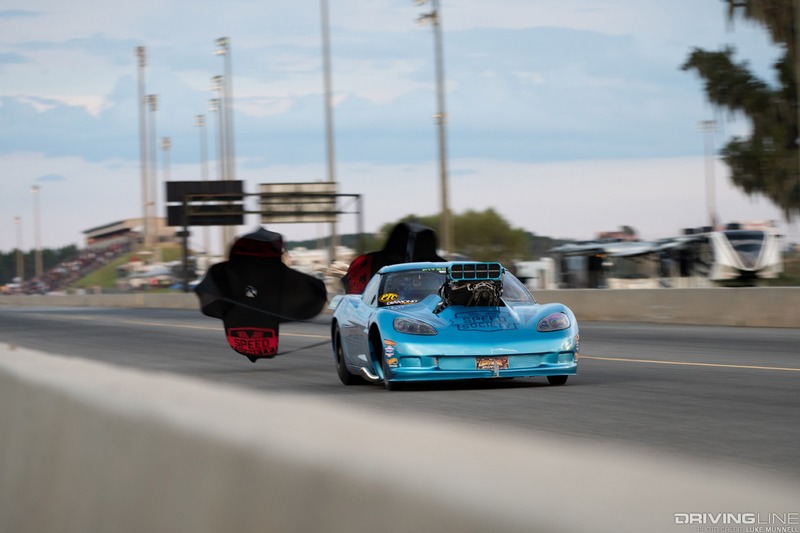 That’s Ziff Hudson and his ridiculously clean, twin-turbo, Pro 275-class car—a regular top contender in Duck X Productions’ radial-tire drag races like No Mercy. 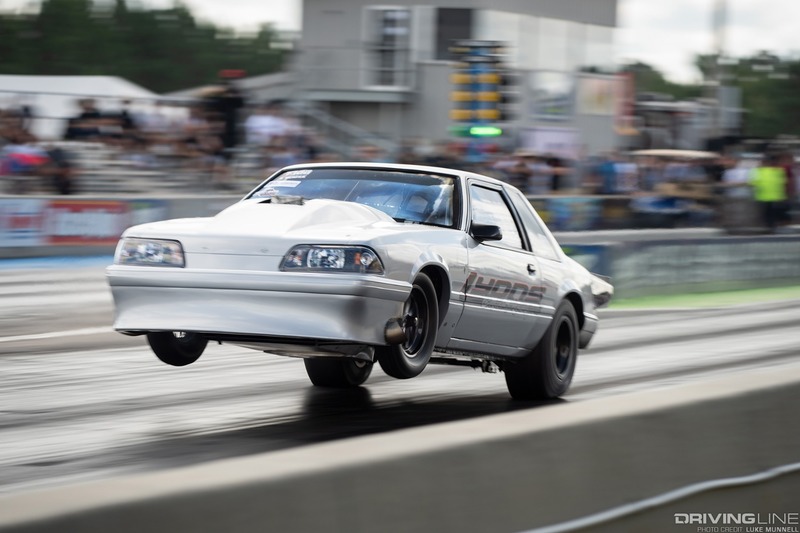 You’ll probably also recall another video from a few years ago, showing a later-model Mustang dragster bogging off the line in a race, before regaining traction and powering to the win on two wheels all the way through the traps. 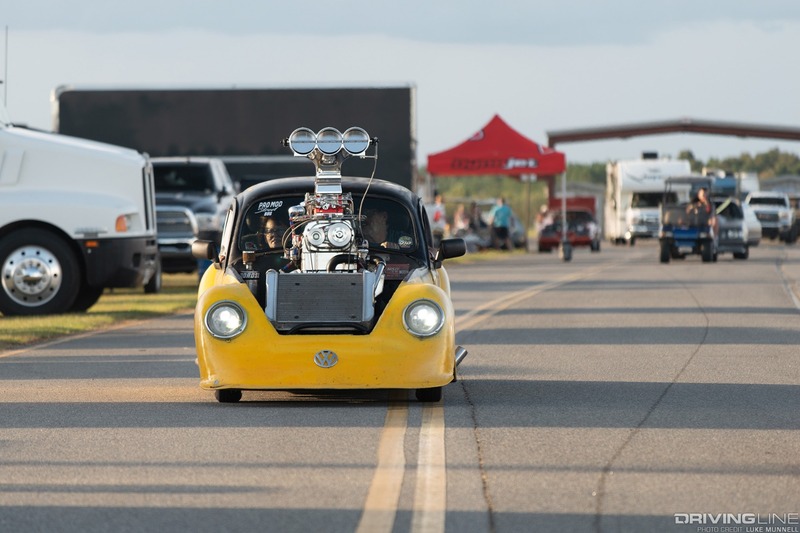 Yep, also at a Duck X event (Lights Out) at South Georgia Motorsports Park. 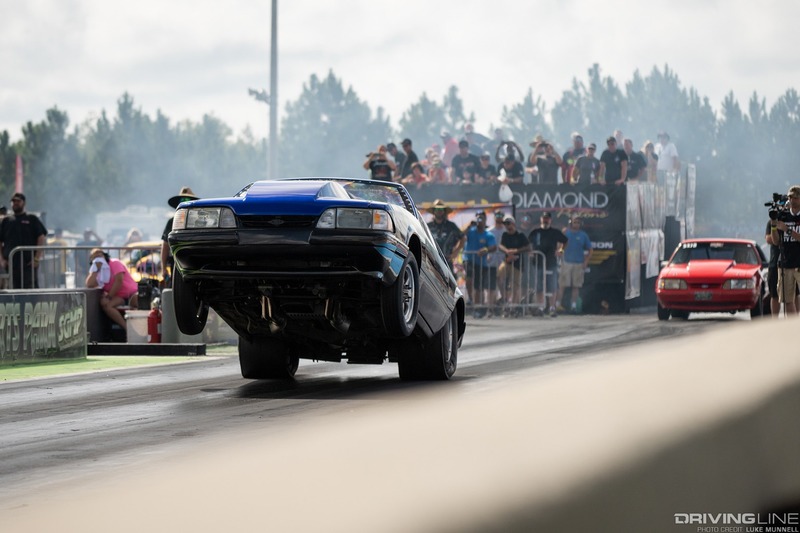 While these might seem like hand-picked extremes of what the Duck X events and their racers have to offer, they’re just the tip of the massive, burgeoning iceberg of radial drag racing. 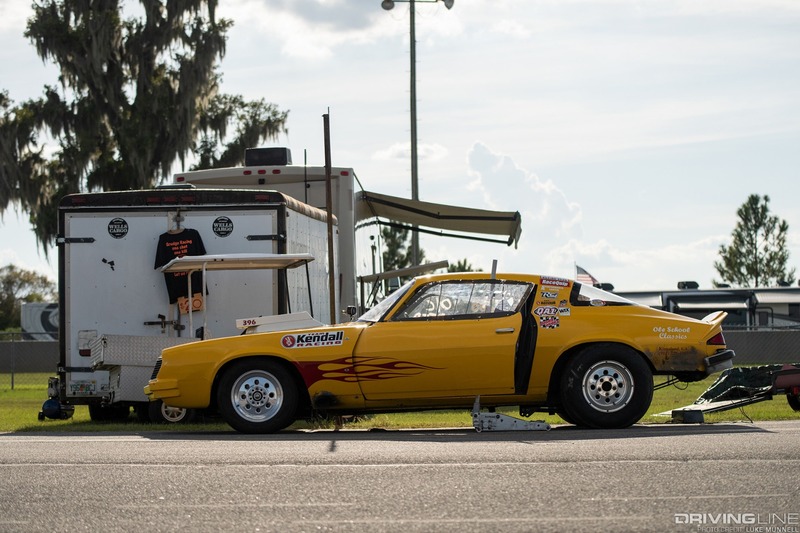 After tiring (pun intended) of the slick-clad status quo in conventional drag racing, Donald “Duck” Long began hosting radial-only drag events at his hometown track of South Georgia Motorsports park, and heavily incentivizing top racers in a variety of classes to participate. 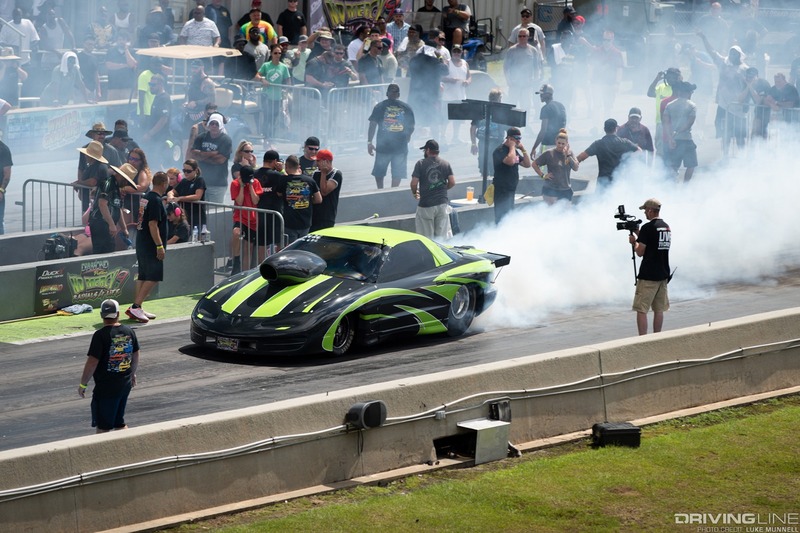 That was nine years ago, and today competition in classes like “Radial vs. the World” at Duck’s two annual events (Lights Out and No Mercy) are seeing better participation, as well as quicker/faster times, than yesterday’s slick classes, and are becoming top classes in series around the country. To catch the latest and, hopefully, greatest action in the radial drag racing world, I ventured to South Georgia Motorsports Park from my cushy L.A. homebase for a week of cultural immersion, some of the hottest/most humid weather of the year, hundreds of ridiculously fast dragsters and getting a better understanding of this changing tide of drag racing. Here’s what I found. 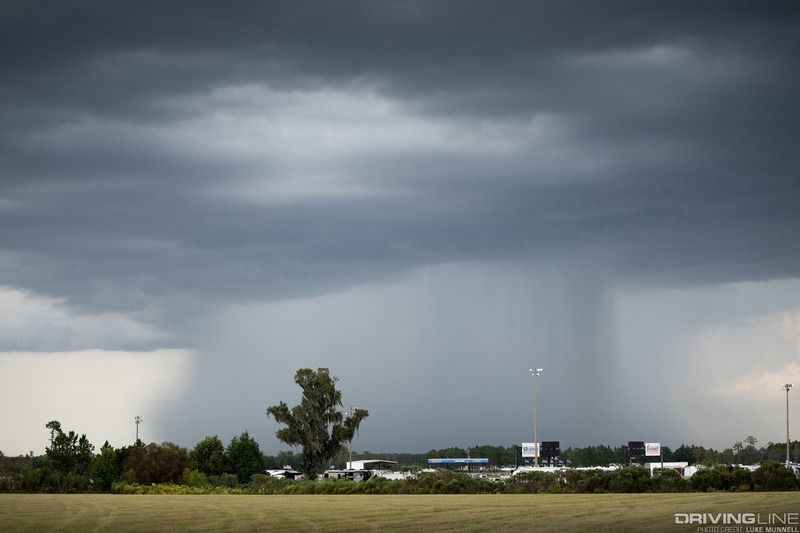 Looking at it from above, South Georgia Motorsports Park (SGMP) might seem to be in the middle of nowhere. 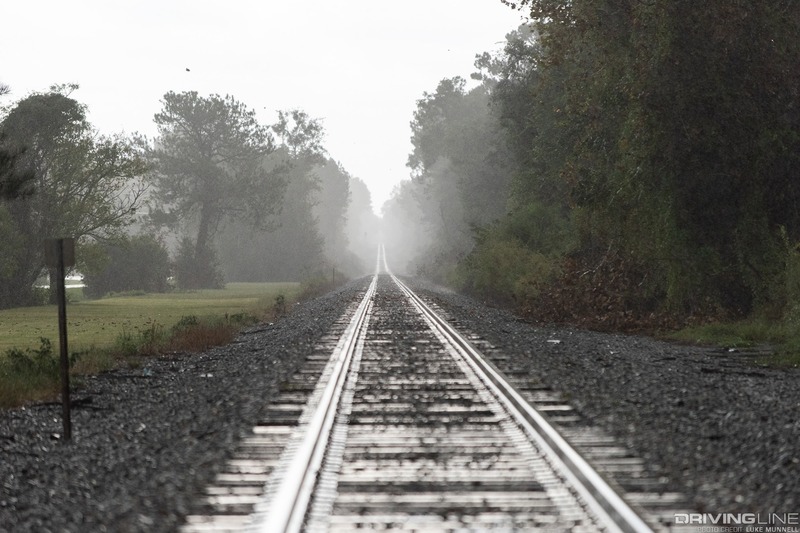 It’s about a two-hour drive from the nearest major airports in Florida’s Jacksonville and Tallahassee, and is located in Cecil, Georgia—a town of 275 people at last count. But, it's free from sound ordinances or pesky neighbors, and only 20 minutes from the nearby college town of Valdosta, Georgia’s plentiful hotels and restaurants. 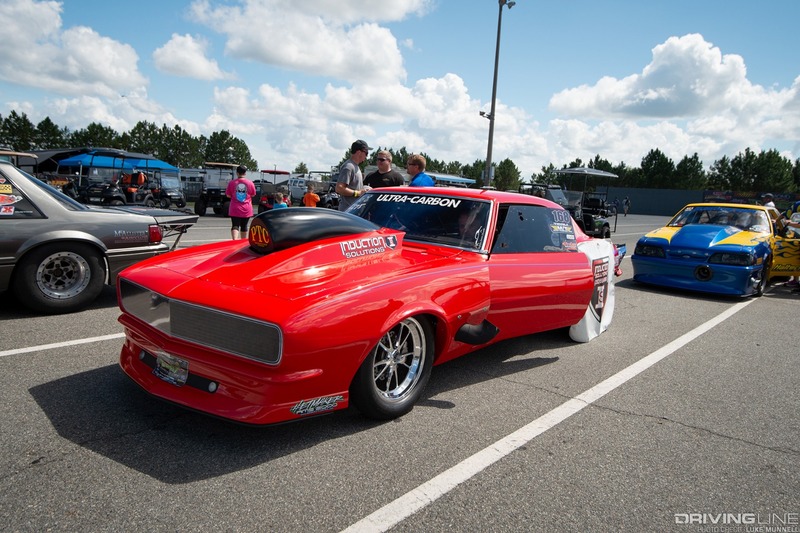 It’s just about perfect for serious drag racing and the associated debauchery. 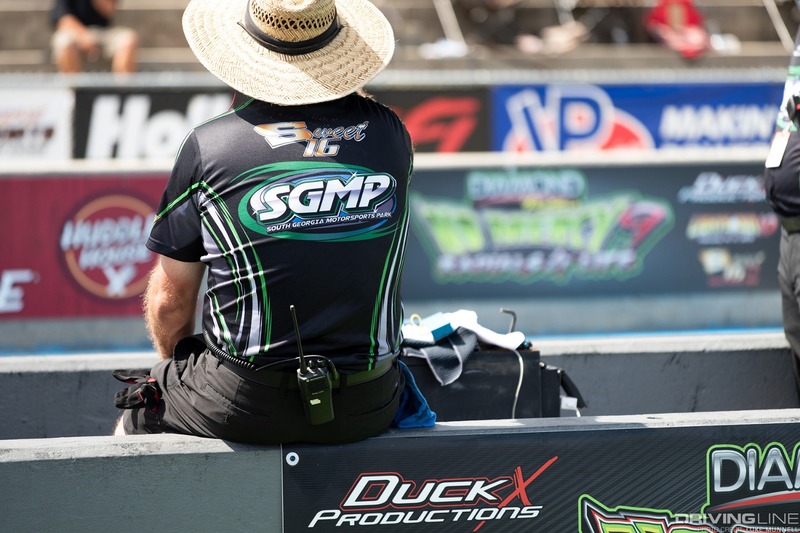 Add to that SGMP’s world-class ground crew and track prep, and tons of pit/camping space, and you’ll come to realize part of why Duck X events have become so popular. 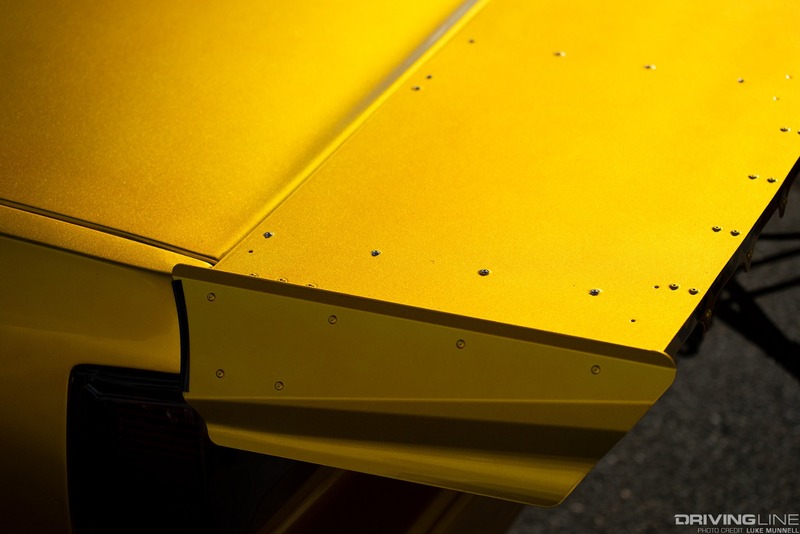 The scene on the ground can only be described as a melting pot of history, culture, methods, geography, engines, chassis, power adders and personalities. 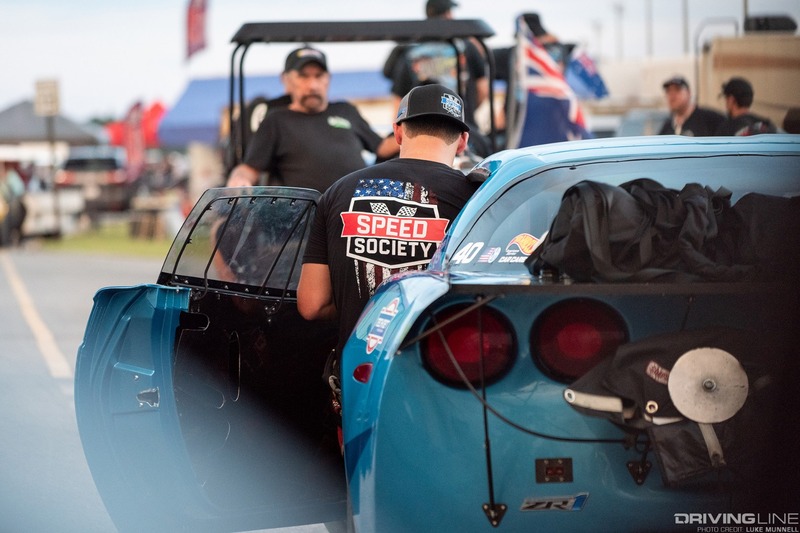 The collective demographic of racers and fans is a lot younger and more diverse than one might expect from a domestic drag racing event, and a lot more high-tech—a testament to the universal truth we gearheads all know in our bones: everyone loves speed. Family race teams were the norm, best friends and competing rivals were welcomed into each other’s pits and camping areas, goods and services (and that side-hustle cash) traded hands, friendly jabs at racing or personal shortcomings were exchanged amongst friends, and everyone—everyone—openly professed their love of sport and country. 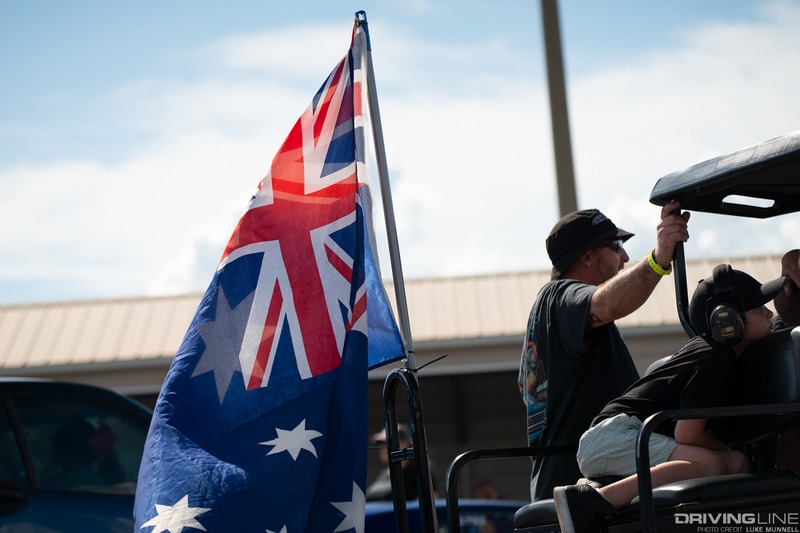 Behind the tough facade that’s common in such a competitive arena, and in contrast to any stereotypes our polarized society might levy on this crowd, those who I had the pleasure of meeting were some of the most friendly, generous and genuine people around. 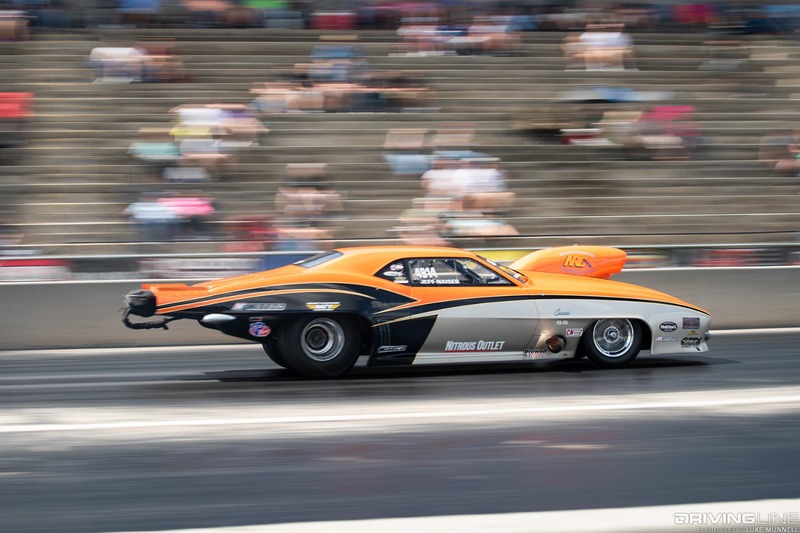 Racing in Duck X events is eighth-mile, since most of what makes drag racing so awesome happens in that amount of space. 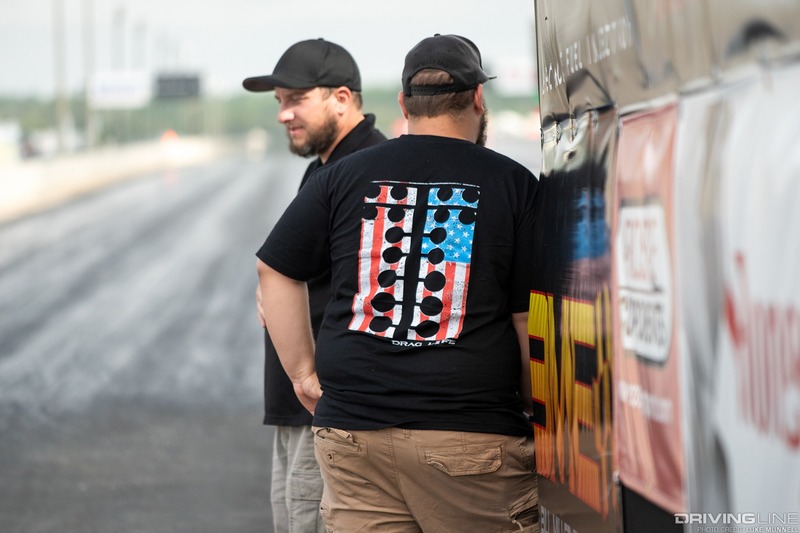 We get the hustling and trash-talking, burnouts, staging games, the pro tree, the ever-important 60-foot, plenty of time and distance down the track for almost anything to happen and some of the closest finishes anywhere. 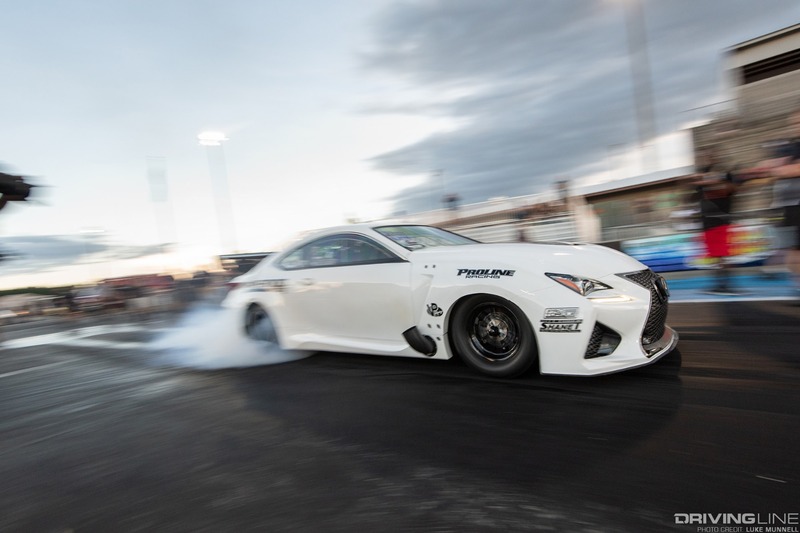 About the only thing quarter-mile racing has over it is more time and speed, but with Radial vs. the World contenders routinely trapping in excess of 210 mph in the eighth, there’s plenty of speed. 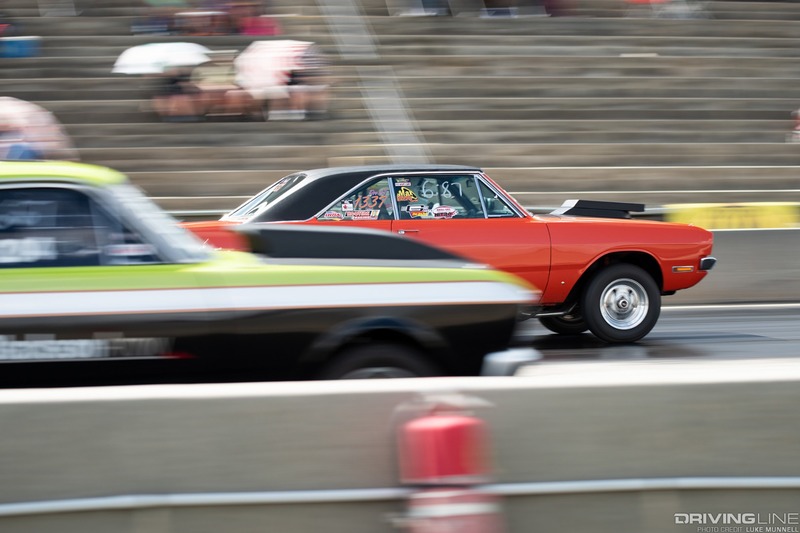 It’s simply too dangerous for many street-appearing cars to go as fast as their engines would take them to a quarter-mile. 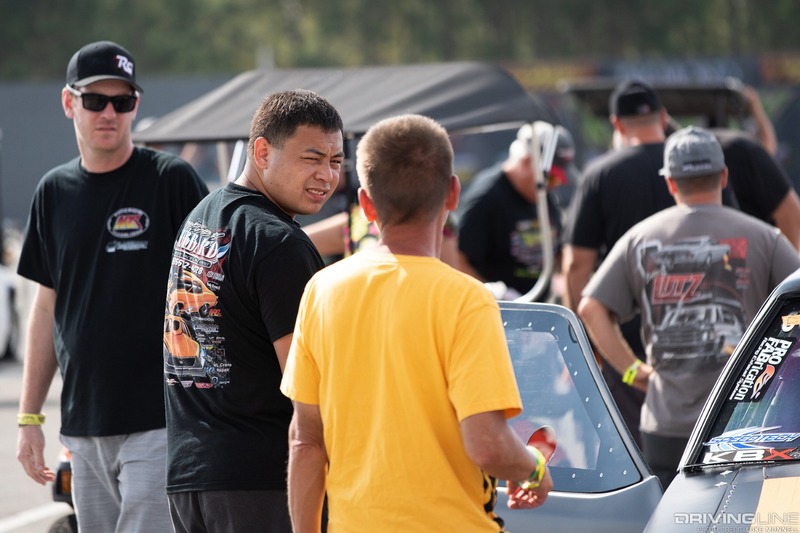 Since its inception, Duck X has offered racers generous winnings, like the $101K in last March’s winner-take-all Sweet 16 battle at SGMP. 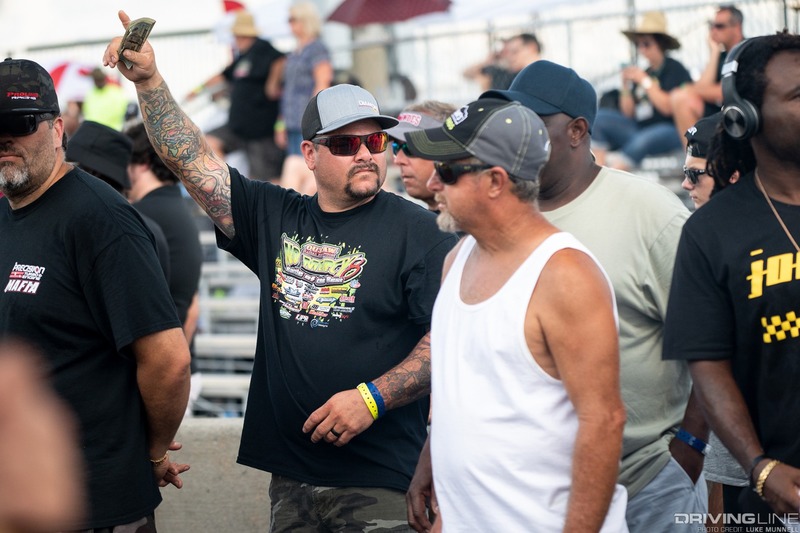 Total payouts for No Mercy 9 exceeded that, and on top of it all, Duck and his team even found a way to arrange donations of a veteran-built race chassis and engine to one of the racing community’s newest Gold Star families. 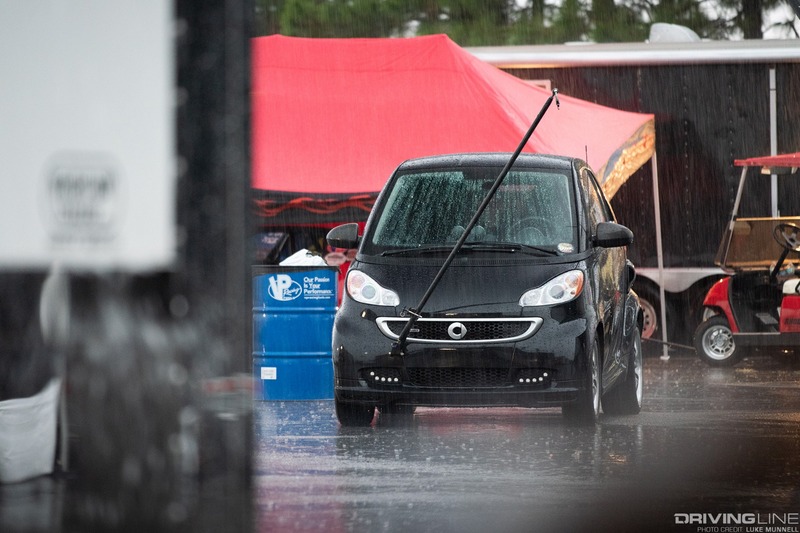 Heat and rain were big factors this time around. 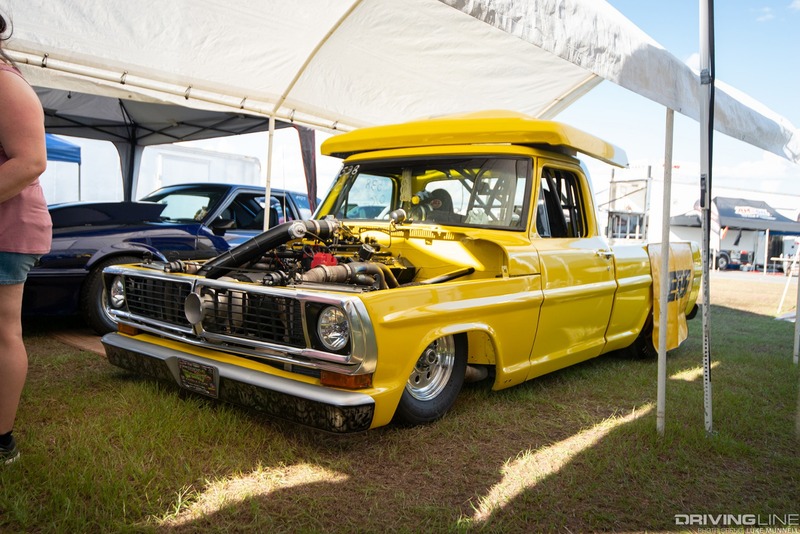 Near 100-degree ambient and 150-degree track temps kept power down for the forced-induction guys, and made finding traction difficult for nearly everyone. 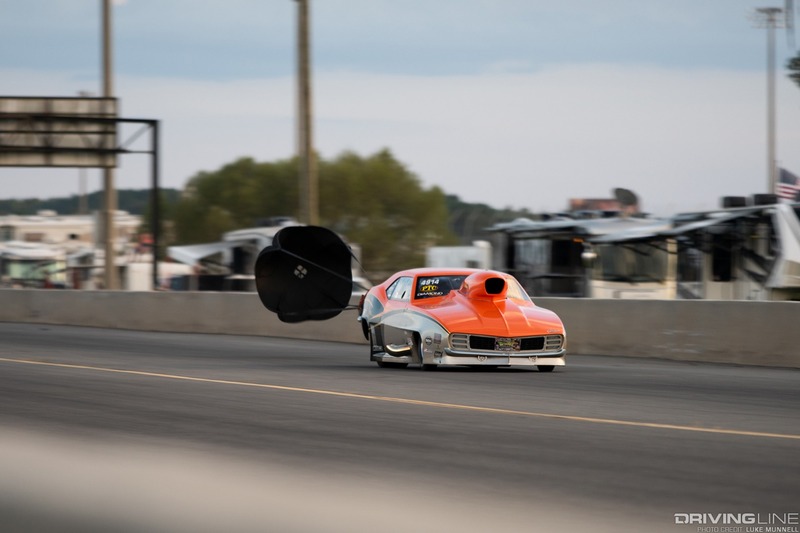 Slightly cooler mornings and evenings brought more grip and some huge wheelies, and the constant threat of pop-up showers kept racing moving at either a round-robin pace with zero downtime between runs, or put everything on hold for hours at a time. 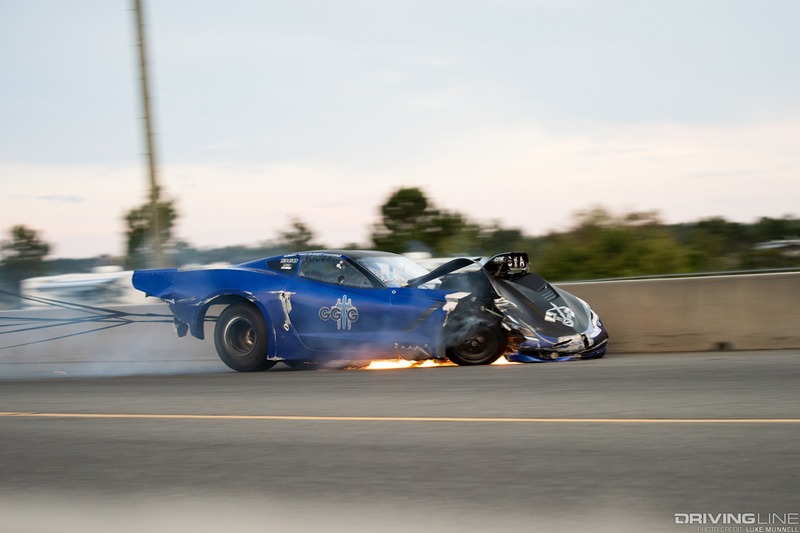 There were a couple scary moments early on, most notably (for me, anyway) when LeRoy Nabors Jr.’s immaculate Radial vs. the World-class Corvette appeared to suffer an engine failure and lose traction on its own oil at the end of a 4.019-second at 187.89-mph pass, and plow straight into the wall just ahead of where I was shooting. 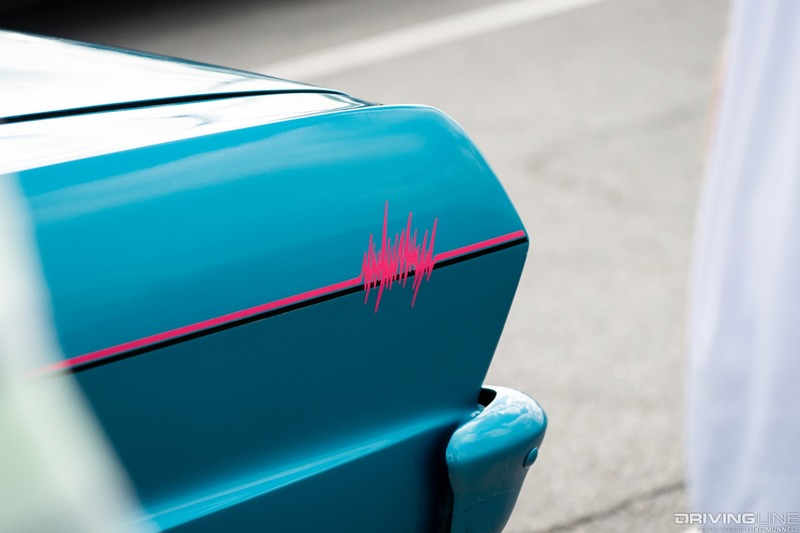 He did an awesome job bringing the car back into lanes and getting out safely, but the car’s damage was too great to continue… this time. 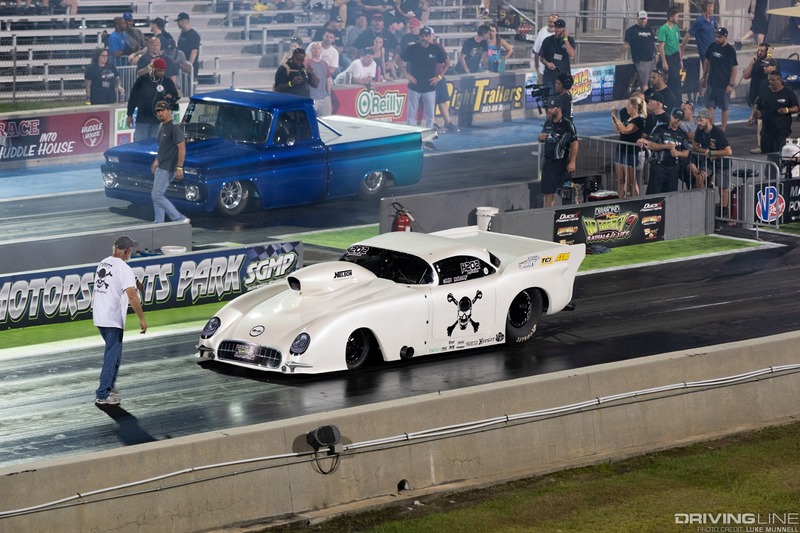 Radial vs. the World (RvW) is just one class in Duck X events like No Mercy, and it can be thought of as the top-flight, fastest class open to just about any chassis (Pro-Mod included), engine, transmission or power adder on 315 DOT or 10.5-inch 3062R or 3362R radials. 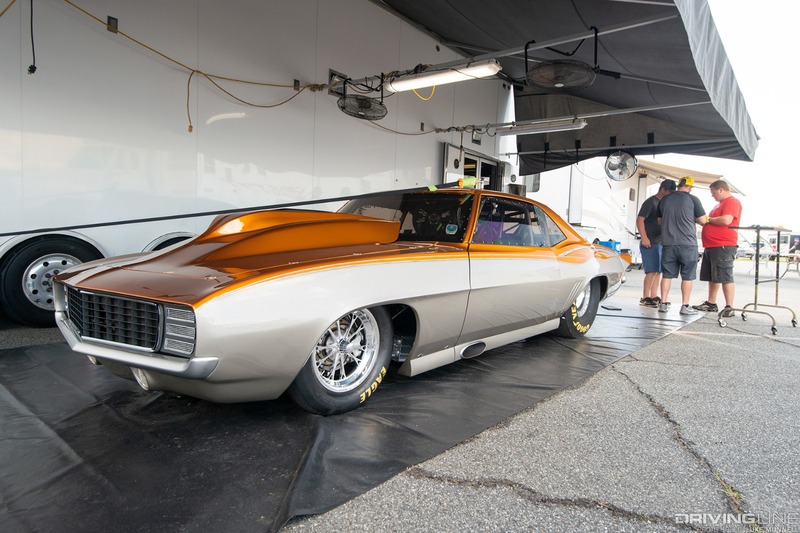 Jeff Naiser and his nitrous-fed RvW-class ‘69 Camaro set the low-E.T. 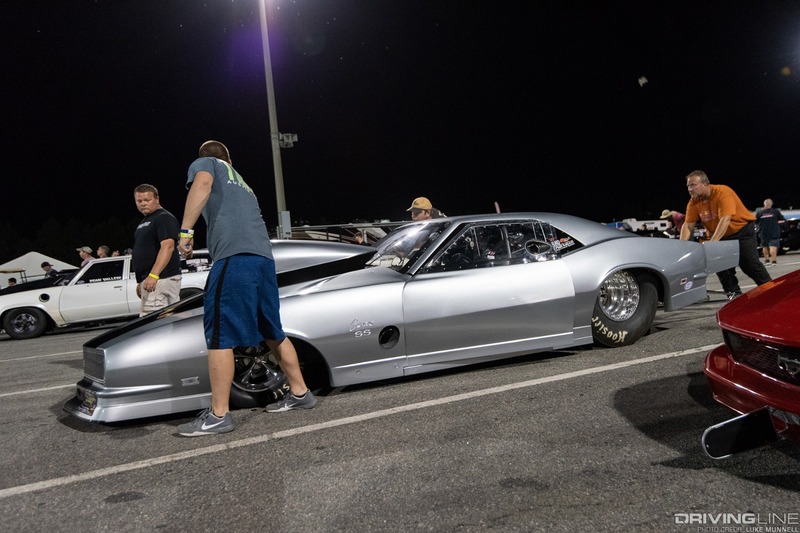 bar for the entire event in qualifying late Thursday night, with a quick 3.762 at 190.35 pass. 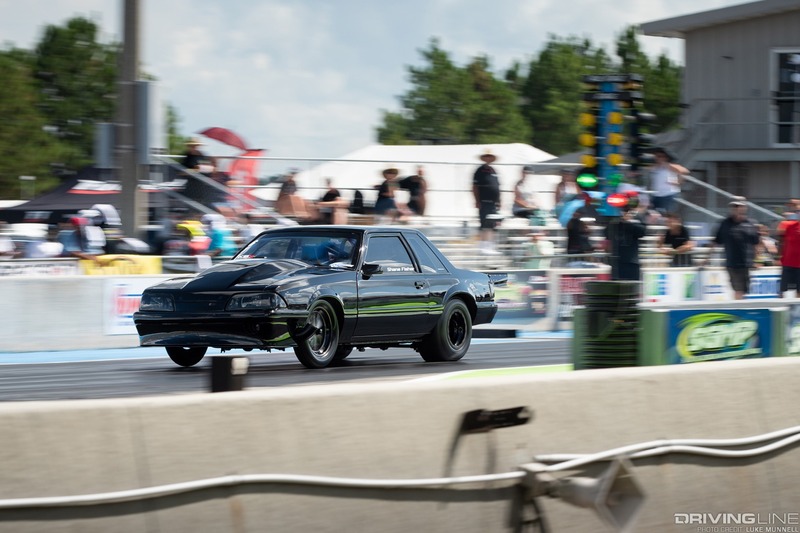 Right behind him, and demonstrating the big top-end power of forced induction, was the twin-turbo ‘78 Chevy Malibu of Mark Micke—winner of that Sweet 16 $101K payout—belting out a 3.768 at 218.27 mph pass in qualifying. 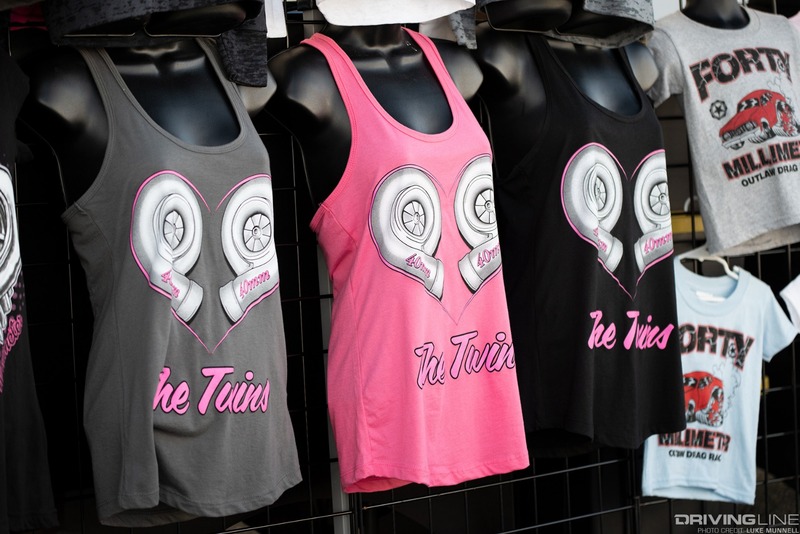 As eliminations began for the field of 32 three and four-second cars, all turbo cars went out by the third round, in the heat of the day. 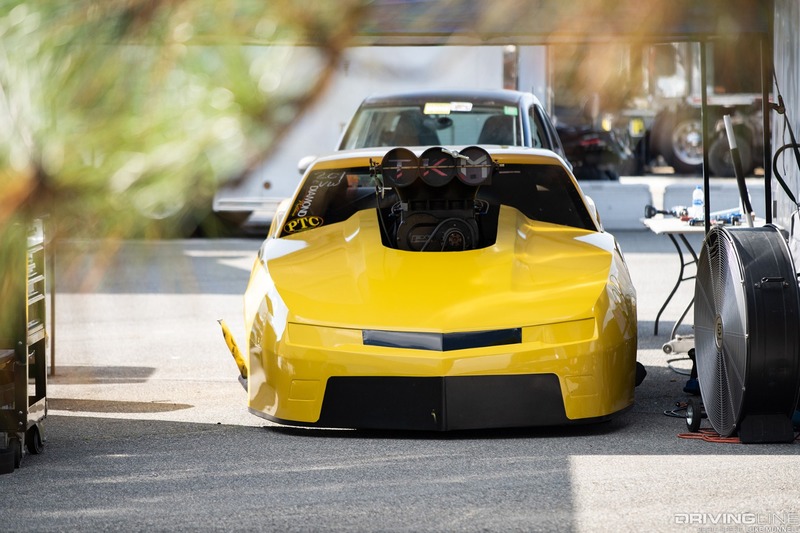 Just when the advantage of his nitrous car began to fade late in the day, Naiser met Alex Laughlin and his insanely loud, supercharged ‘12 Chevy Corvette. 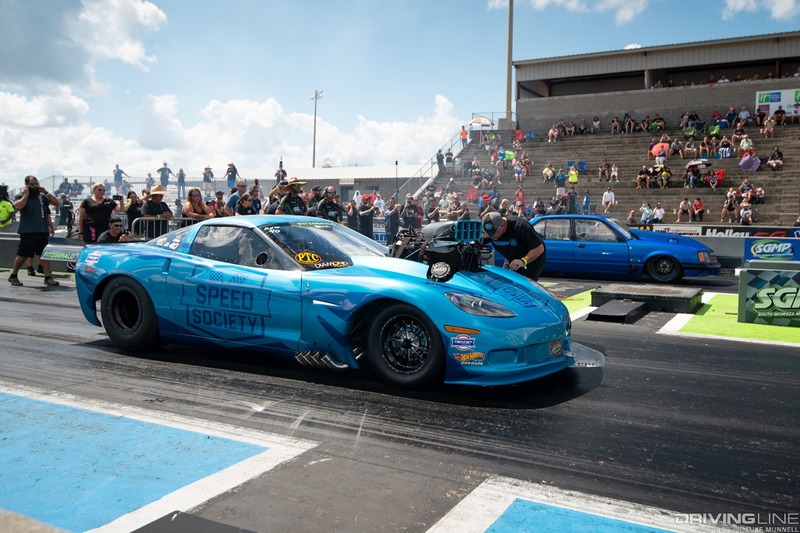 In one of the closest bouts of the day, Naiser crossed the stripe first by a very small margin: 3.792 at 197.62 to Laughlin’s 3.808 at 196.73. 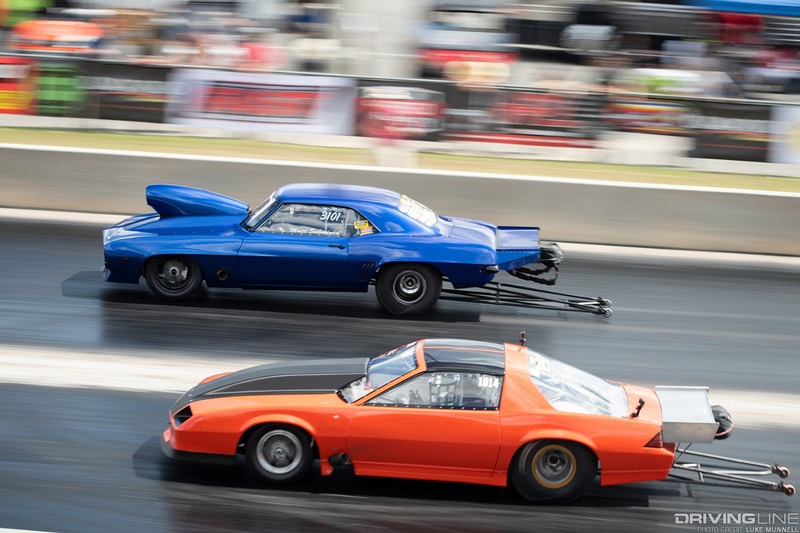 Not far behind RvW in the Duck X pecking order is Limited Drag Radial. 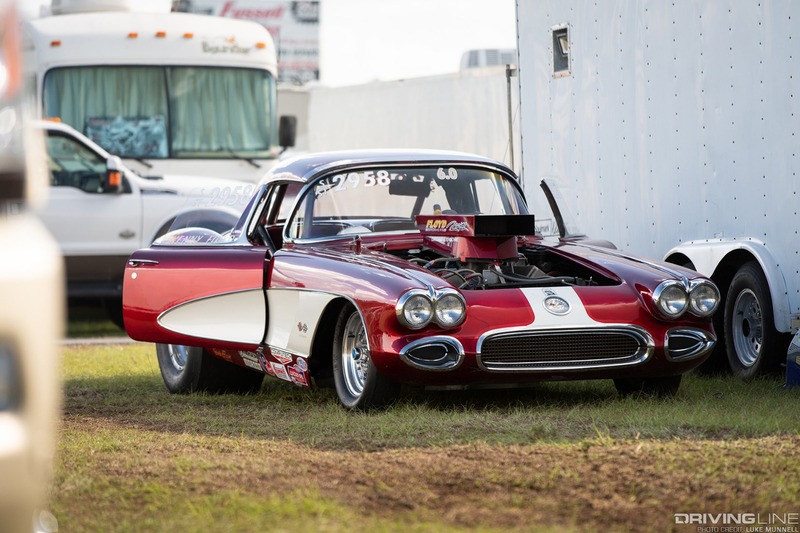 These cars must appear largely faithful to their stock designs and dimensions (so no Pro-Mod chassis), and stock firewall locations must be retained. 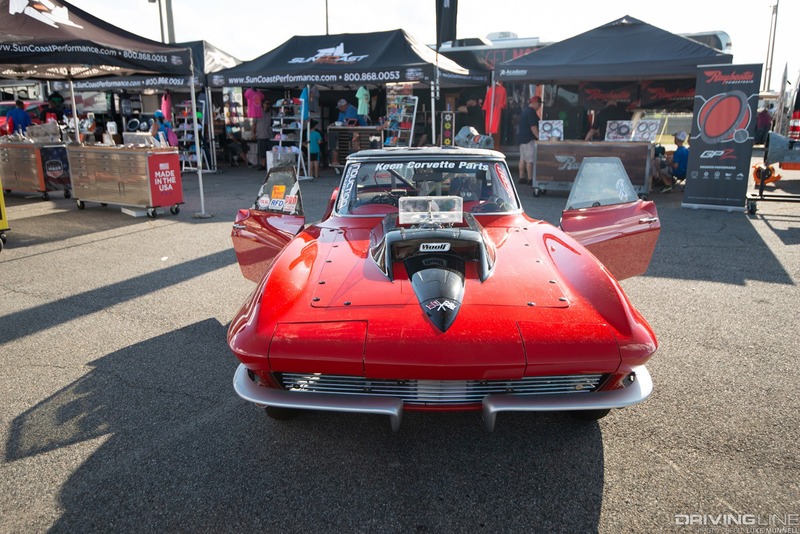 Removable parts can be made of lighter-weight composites, and back-halfing is allowed, but no tube chassis or even wheelie bars are permitted, and competitors must adhere to power-adder limits and run 295 or 275-series tires. 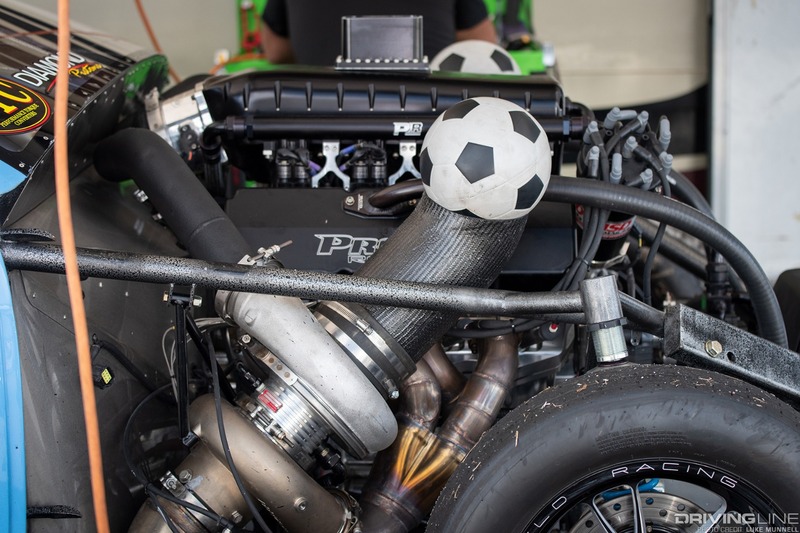 Still, that didn’t hamper LDR racers from running the SGMP eighth-mile in around 4.1 or 4.2 seconds and over 188 mph. 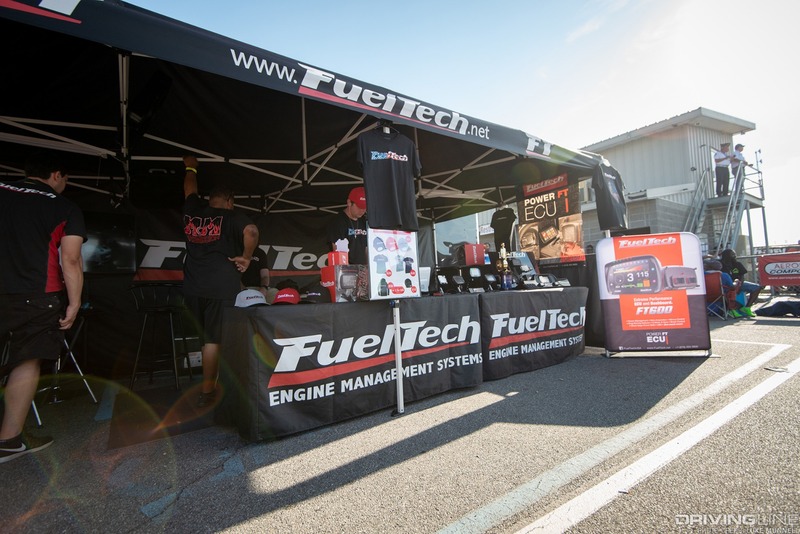 Eighteen drivers qualified for competition, led in E.T. 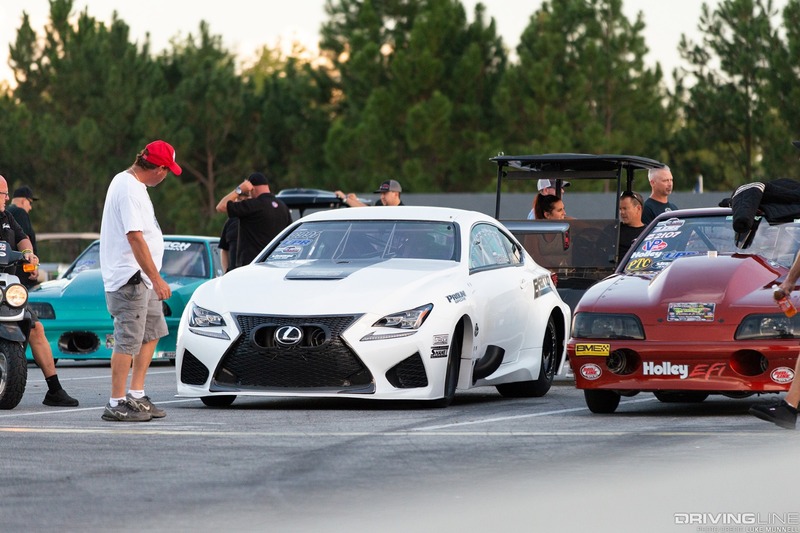 and trap speed by Daniel Pharris in the black sheep of the entire event, on several fronts: the white, twin-turbo, Ekanoo Racing ‘15 Lexus RCF, with a 4.135 at 188.07. 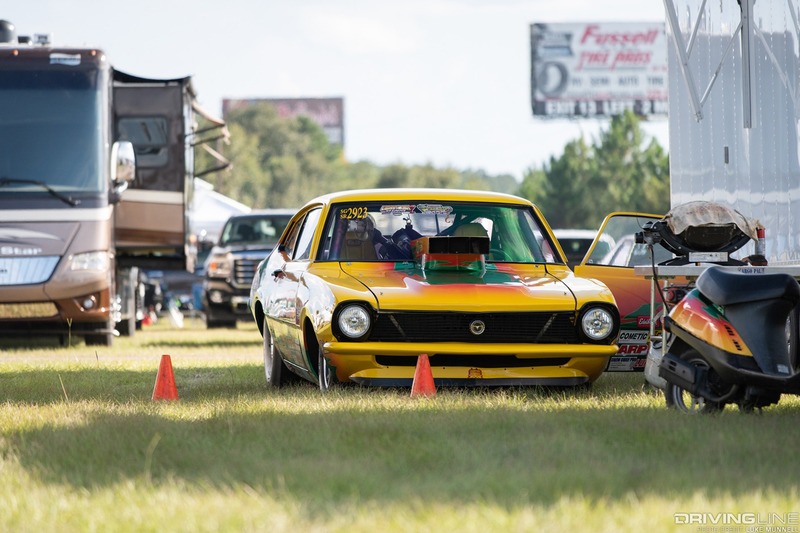 Pharris held strong and worked through his side of the bracket, but so did another competitor: Justin Martin and his twin-turbo, big-block ‘72 Chevy Nova, who set a record on his semi-final bye run with a blistering 4.097 at 189.20 pass. On a bye run! Martin would go on to phase out Pharris in the finals with a 4.121 at 188.60 to Pharris shutting down midway through his 6.575 at 98.04 pass. 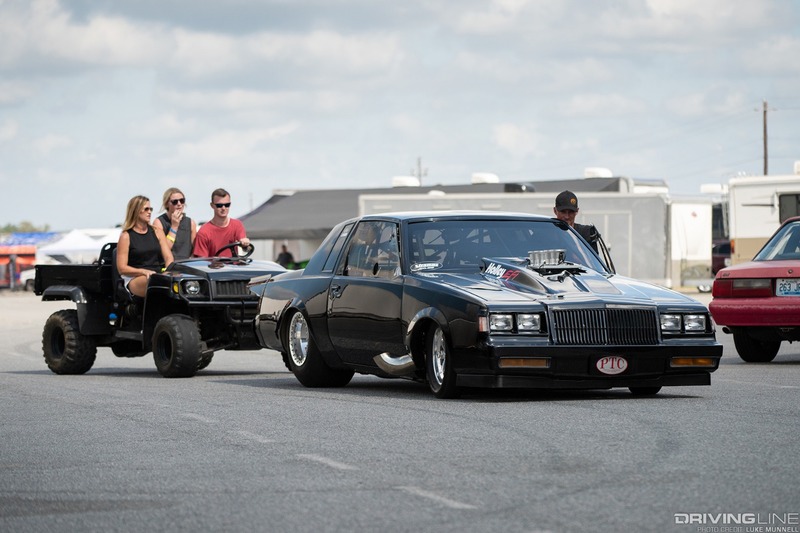 Almost neck and neck with LDR at No Mercy was the Pro 275 class, for similar cars as LDR but with some weight penalty differences and the mandated use of Mickey Thompson ET Street Radial Pro 275 tires. 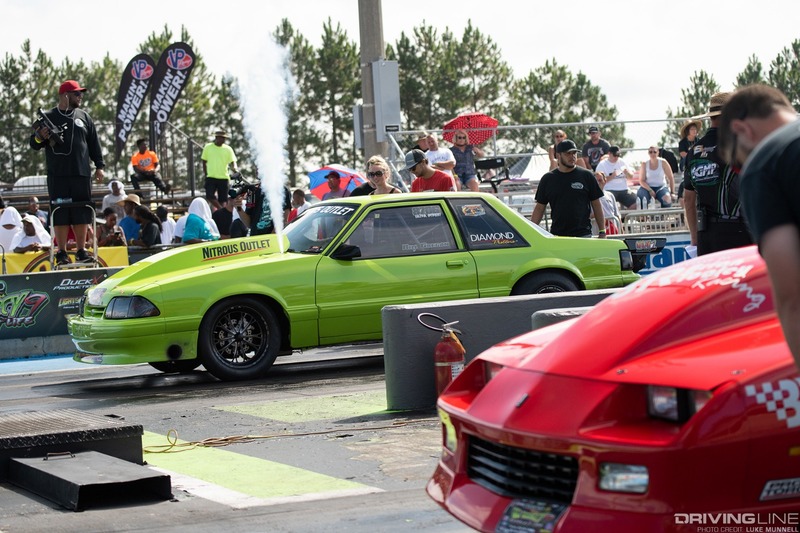 The times at the top of each class were nearly identical, with Pro 275 qualifying front-runner Don Lamana posting a 4.136 at 199.82, just 7/100ths of a second ahead of next-closest competitor Ziff Hudson in that monster Mustang, with a 4.203 at at only 169.81—hinting that the car had much more to give. Don and Ziff each worked their side of the ladder, benefiting from the odd bye run here and there, before somewhat predictably meeting in the finals. Ziff had been fighting to find traction all day. 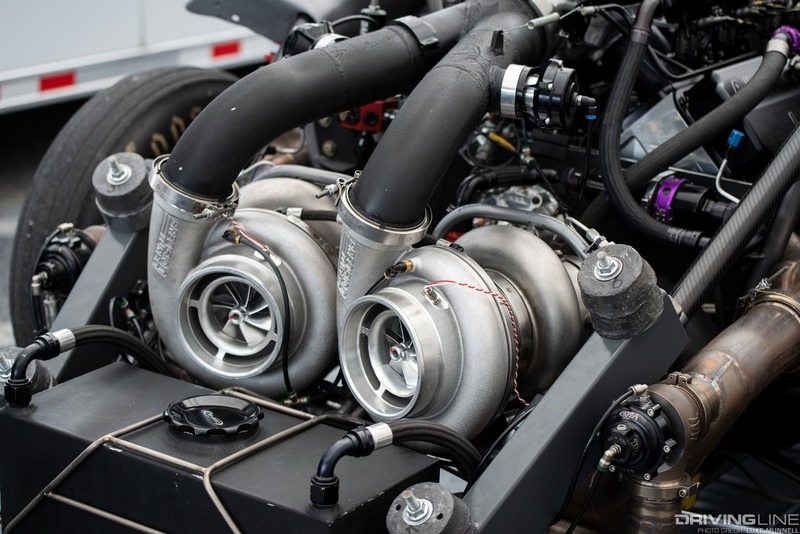 His new twin-turbo setup we think delivers more torque than his previous single, and with the inconsistently hot track, there just wasn’t enough time to get it dialed in. Ziff got a huge jump on Don when the final-round tree dropped, but when those traction gremlins reared their heads, Don powered off to an easy win. Just a wee bit off the pace of LDR and Pro 275 at No Mercy was Outlaw 632. It's another door-slammer class, but one where up to 45-inch of front overhang, 632 big blocks (bored out to a max 400 CID) and just about any tire are cool. 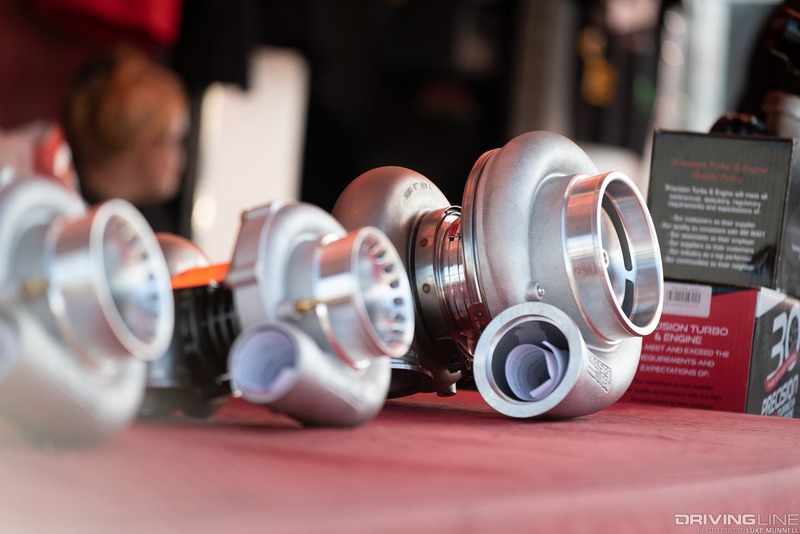 Turbos and superchargers aren’t, though—just gobs of nitrous. 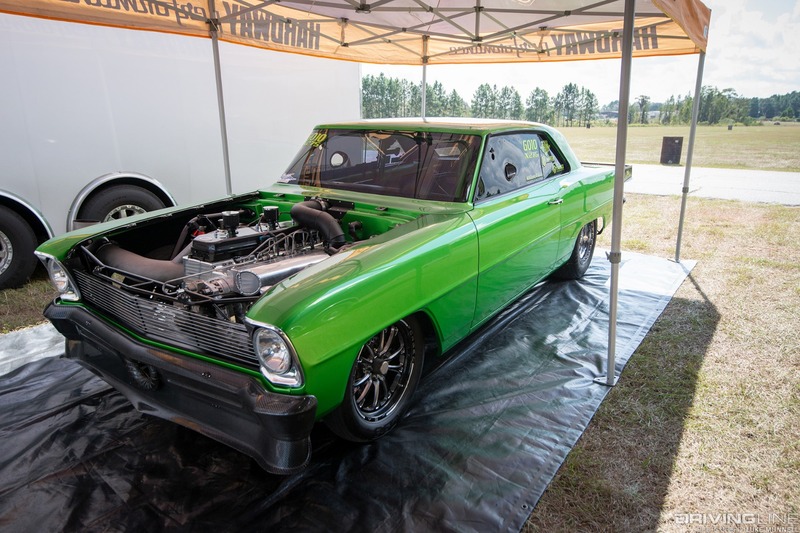 Making the most of that rulebook in qualifying was Sam Harvey, who piloted his ‘66 Chevy to a 4.144 E.T.—nearly 2/10ths ahead of his nearest competitor. 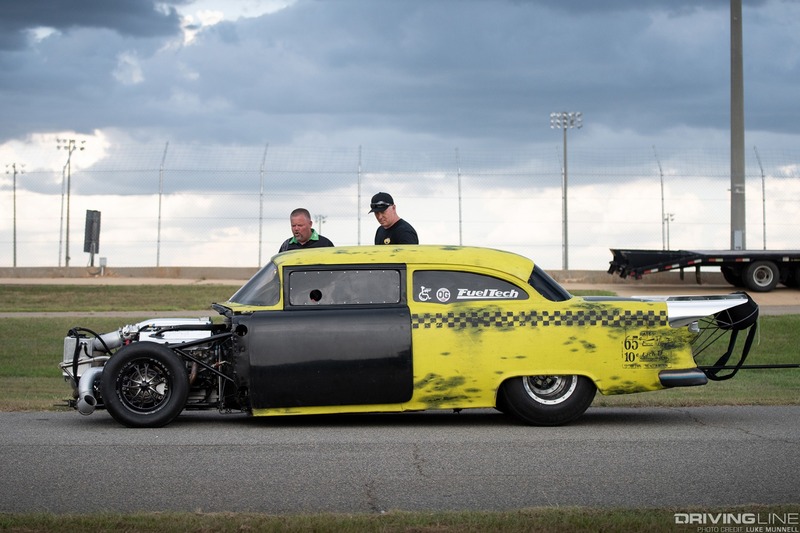 Just when it seemed to be in the bag for Sam, he broke in the first round of eliminations. 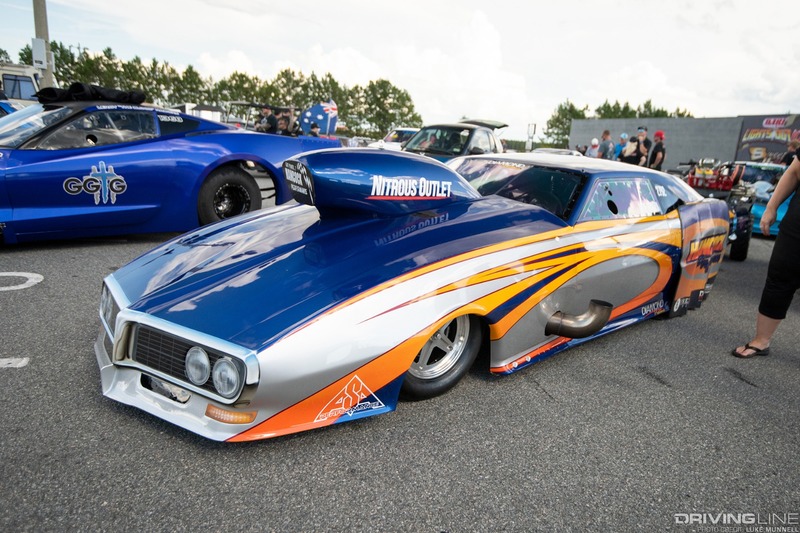 Three rounds later, it was Mike Starvines and his ‘69 Camaro that emerged the victor, with a 4.478 at 157.89 to his opponent’s 4.538 at 158.20. 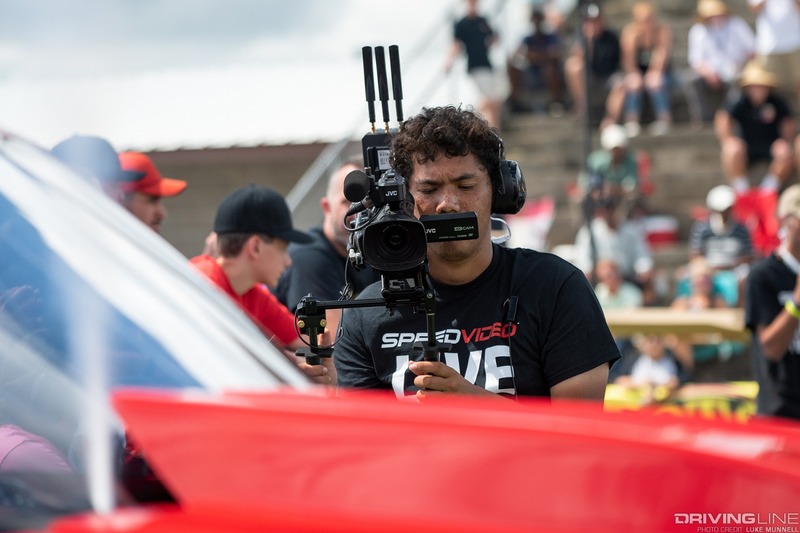 In a lot of regards, X275 is one of the most exciting classes to watch. 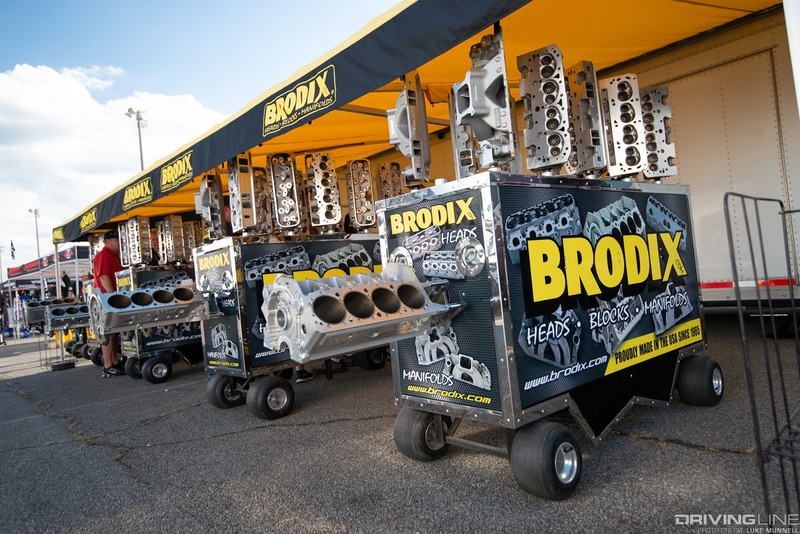 Another class in which competitors are limited to 275-series or 28x10.5 radials, cars here are even more faithful to their stock sheetmetal. 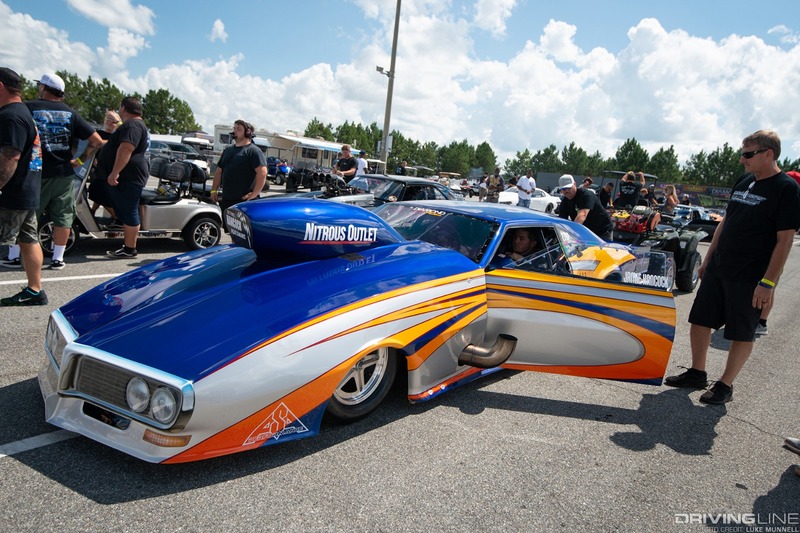 A full 32 cars took to the tarmac of No Mercy 9, with 16 of them qualifying in the 4.4 to 4.5-second range—that’s some close competition! 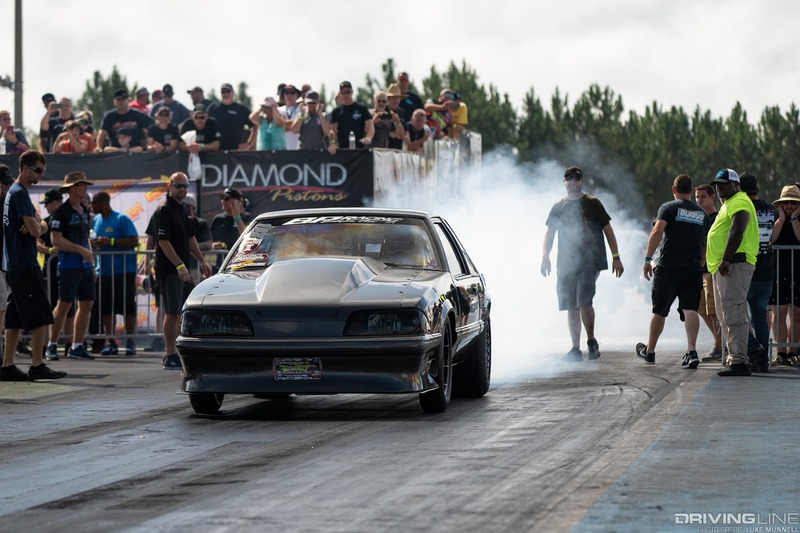 While qualifying leader Shane Fisher and his ‘93 Ford Mustang’s 4.428 at 173.99 might have been quicker than the field, if the racing throughout the weekend taught us anything, it’s that anything could happen in this class. 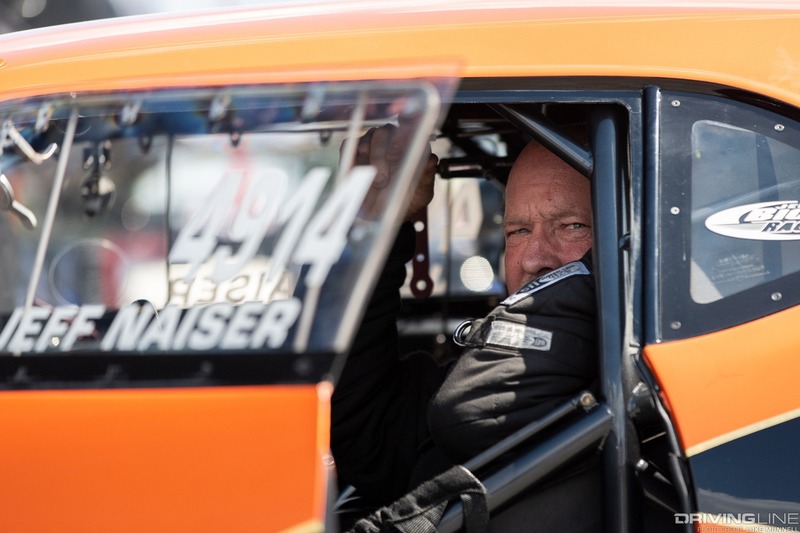 Fisher’s performance gap indicates that there’s still a lot of room for growth in the class, but his ultimate fate proves that having the advantage isn’t always a sure bet for victory. 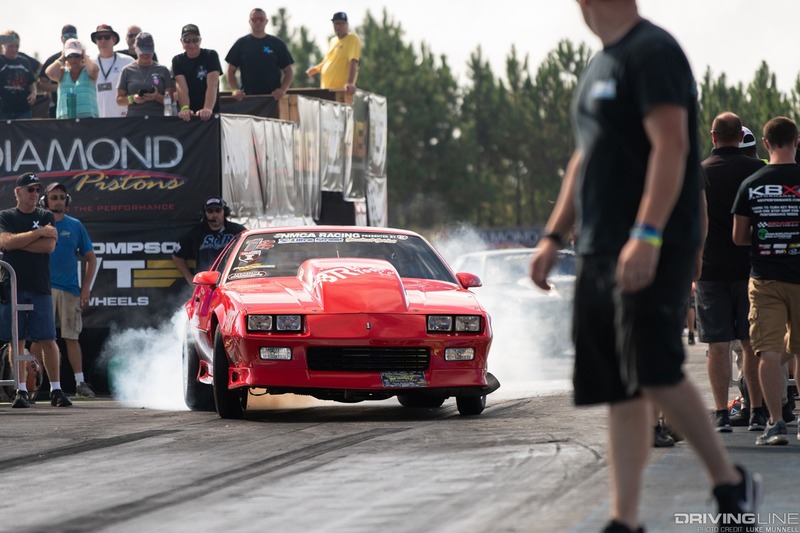 As Fisher worked through his side of the eliminations bracket, 14th-seed qualifier Rob Gross did the same on the other—just barely staying ahead of his competitors with 4.4 to 4.5 E.T.s. 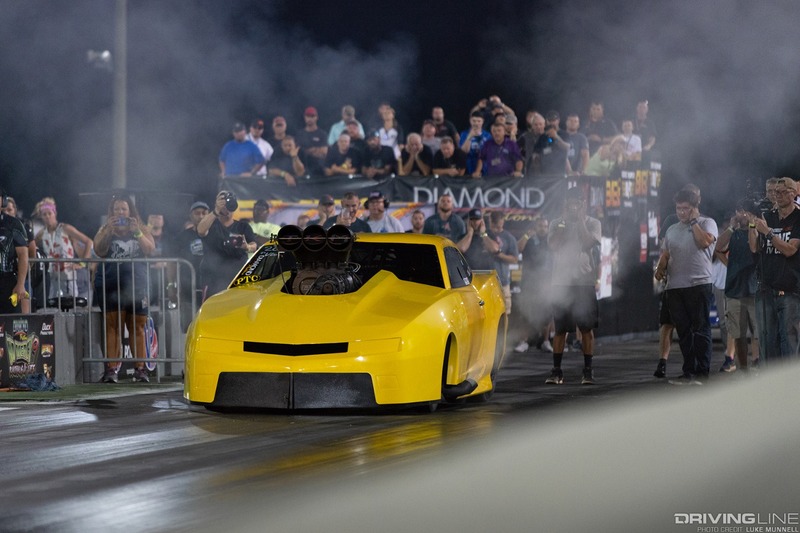 We’re not sure what made Fisher drop from his consistent low 4.4-second competition passes down to a 4.810 at 159.61 in the finals, but when he did, ol’ Rob Gross belted out another modest pass, this time a 4.526 at 163.59, to earn the upset win of the event. 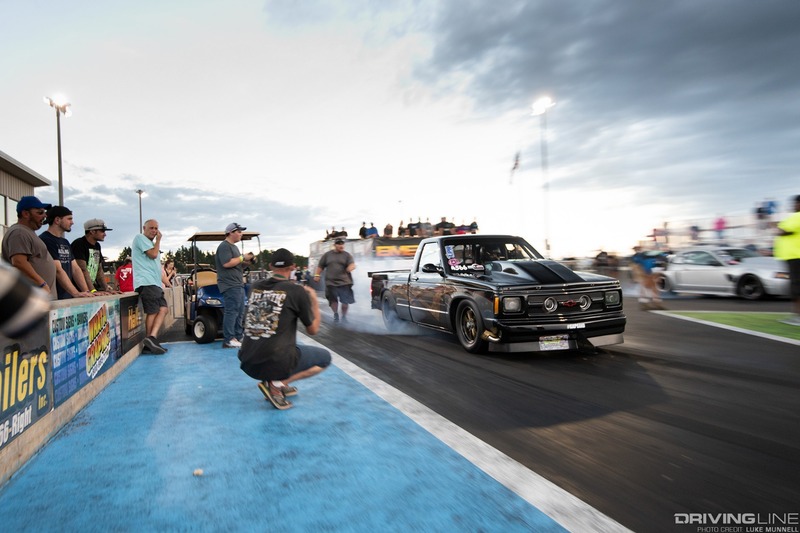 Ultra Street is Duck X Productions’ newest class. 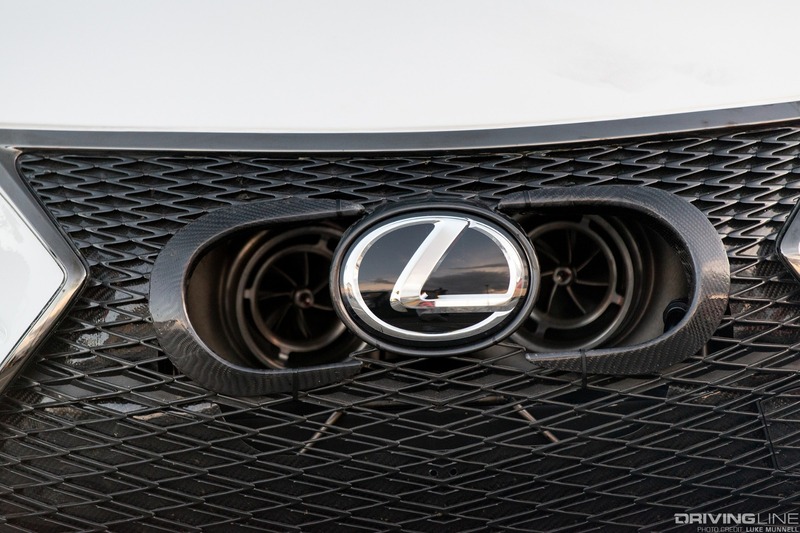 It's similar to X275 in its emphasis on largely faithful production cars, but also adds the option (and incentives) for racers to battle on a 255-series tire. 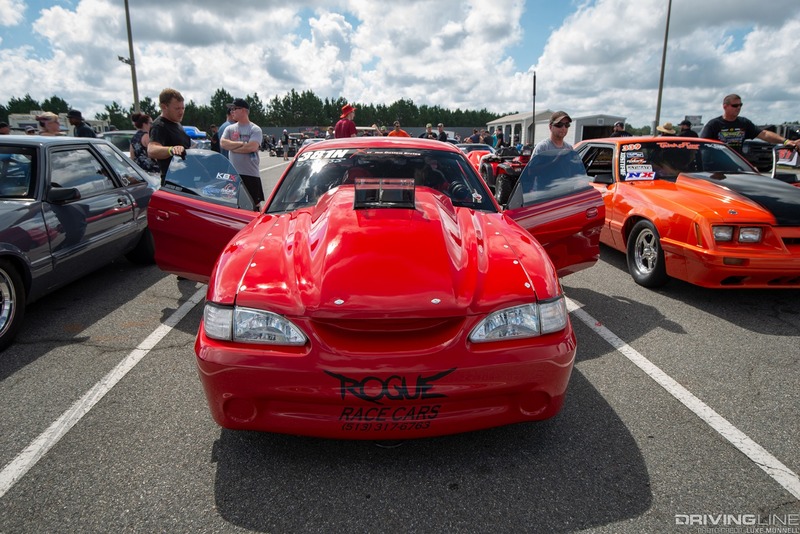 Qualifying was led here by Rodney Ragen with a 4.689 at 156.43 over the two closest of 22 competitors (nearly all Mustangs or Camaros), each running 4.73s. 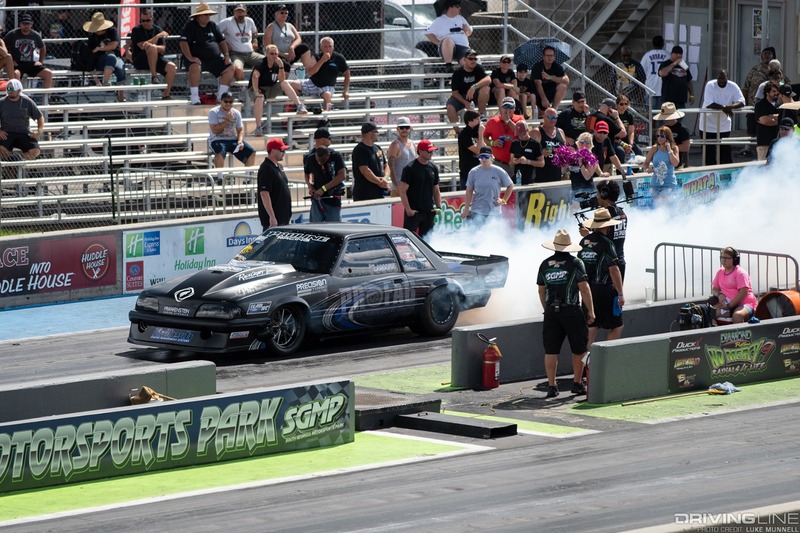 No upsets here—Ragen dominated all the way to the finals, earning the win with a 4.703 at 156.57 when the barely quicker Joel Greathouse (4.690 at 151.09) redlit off the line. 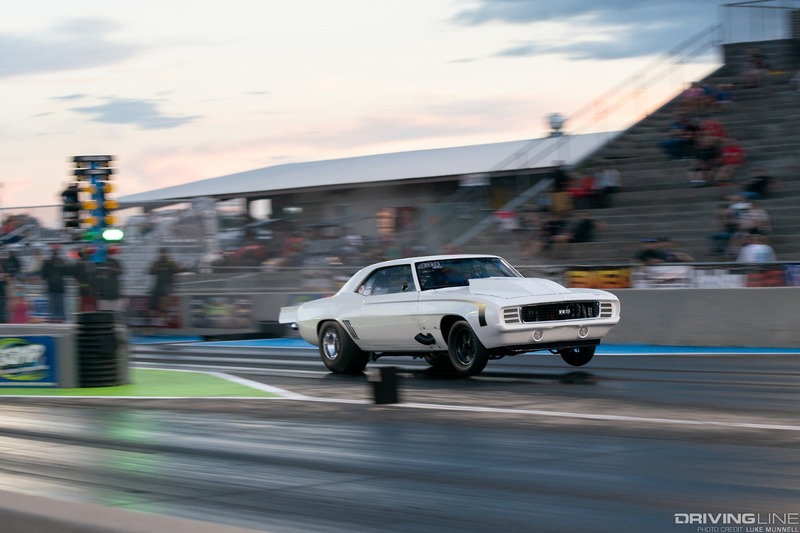 If 255 seems like a small tire for serious drag racing, try 235. While you’re at it, enter in Duck X’s aptly named DXP235 class. 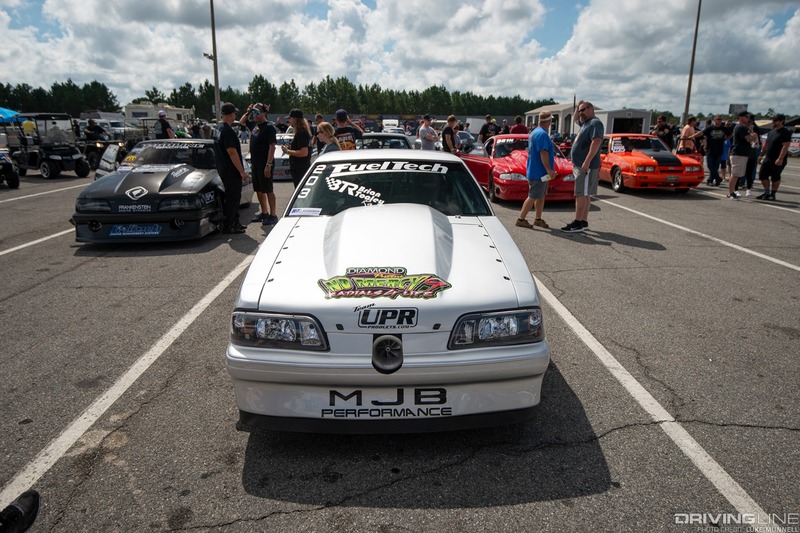 You might not expect it by looking over the times, but this is a class for even closer-to-stock street cars, with limits on engines and power adders, running on either a 235/60-15 tire or 26x8.5-inch bias-ply slick. 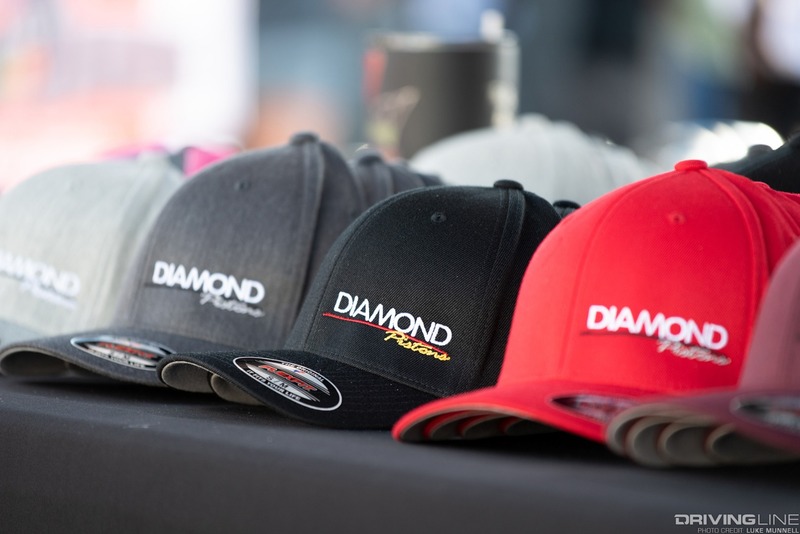 Only 10 cars comprised the DXP 235 field at No Mercy 9, but the top seven were separated by only a tenth of a second. 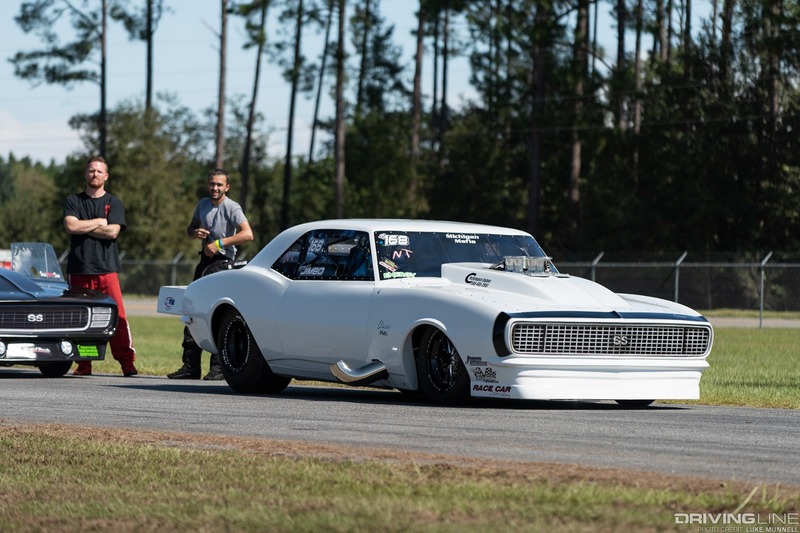 Leading the pack in qualifying was Jason Anderson and his ‘69 Chevy Nova with a 5.218 at 134.30, with Jonathan Insley right behind him with a 5.220 at 133.55. 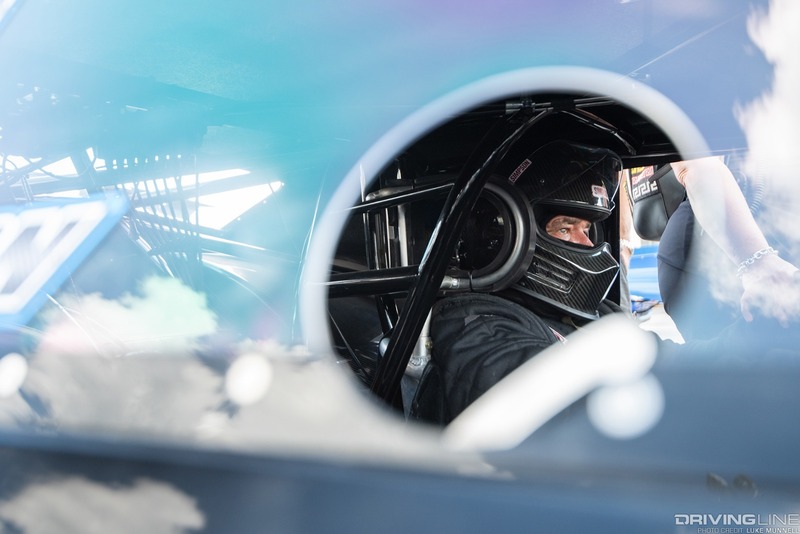 Come race day Anderson would out himself in the first round of eliminations, while Insley would run consistent 5.2s, eventually taking the win with a 5.208 at 134.50 and a perfect .000 reaction time. 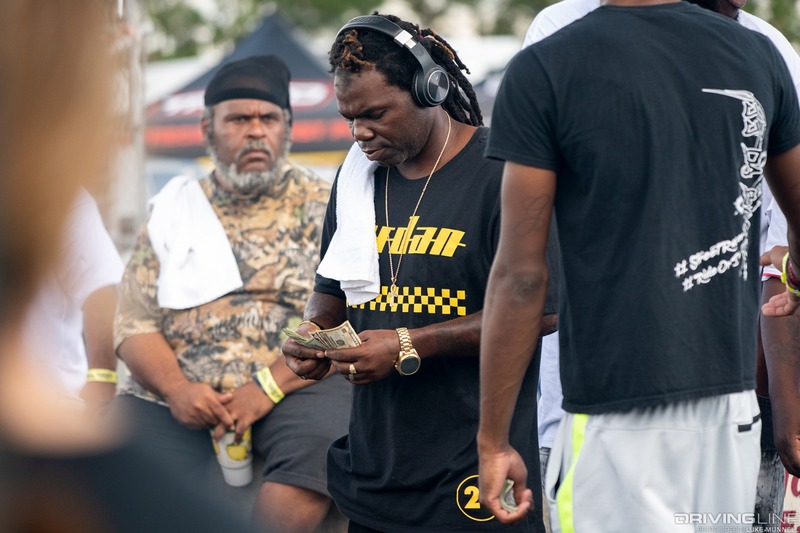 It’s hard to imagine, but the top qualifiers and final battles above barely scratch the surface of fun and excitement at No Mercy 9. More awesome burnouts, blowouts, blow-ups, wheelies, trash-talking, side-betting, amazing saves, near misses and extremely close finishes went down throughout the four solid days of racing than we could ever mention, and that’s not even elaborating on the overall fun and friendly atmosphere events like this always seem to foster. Lights Out 10 has recently been announced for February 14-17 at SGMP, and Sweet 16 number two is scheduled for March 21-23. 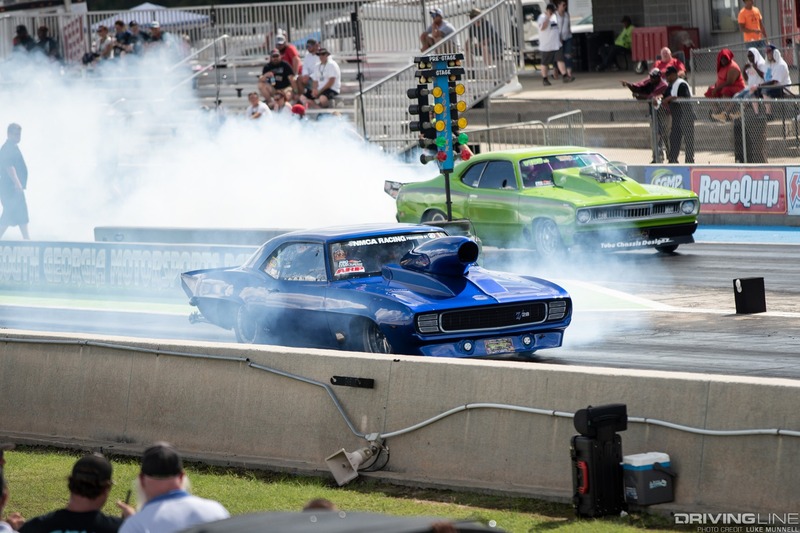 Those are two chances for you to take part in the action before next racing season really rolls around (dates for No Mercy 10 are expected once again in late September/October). 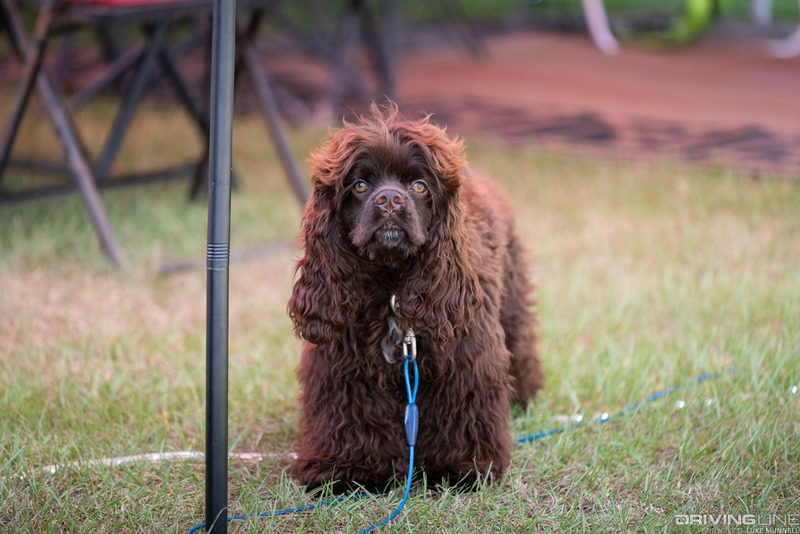 If you need more encouragement to go, check out the gallery below. 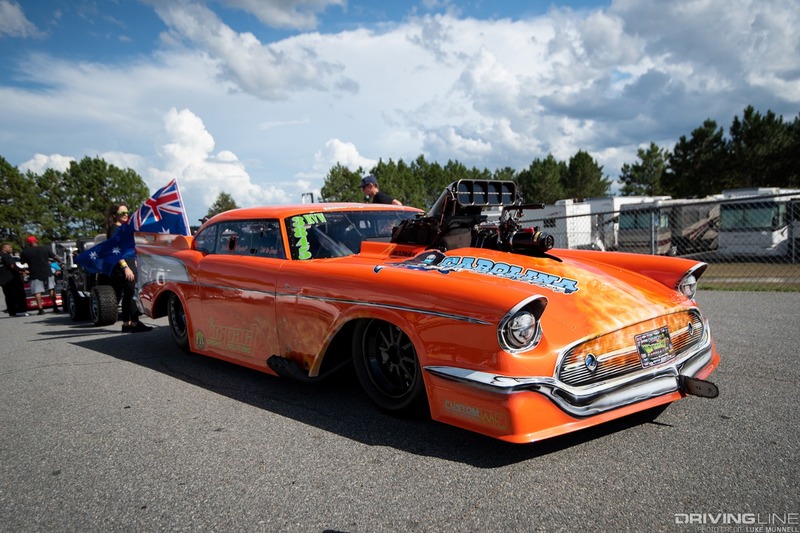 Have you seen a diesel dragster? 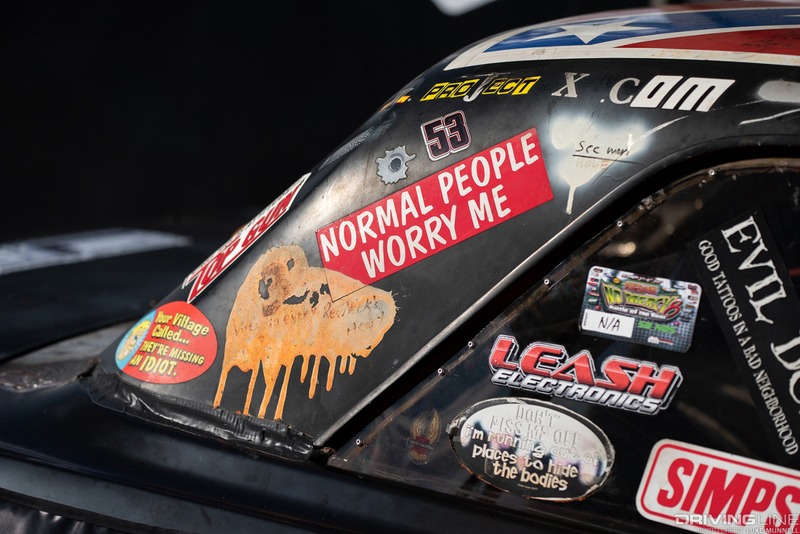 Here is the Anatomy of a Pro Mod Diesel Truck.